Génaf is an independent, non-political, non-religious association (not-for-profit NGO, under France ‘law 1901’). It was founded in 2003 with the mission of contributing to the development of education in West Africa. The members are composed of students and young professionals united by the same will: promote cooperation and projects in partnership with African youth organisations to develop a more opened education. The projects Génaf carries out are based on four essential values: solidarity, cooperation with the West African youth associations, exchange, as sharing inheres in all projects, and local impact, because efficiency of development projects needs to be an absolute focus. Génaf is convinced that Education is a primordial catalyst to human development. One of the first source of wealth for a country is its population, and the youth is its future. Giving an appropriate schooling to each child is building the fertile-ground which is necessary to development. For these reasons, Génaf commits to contribute as best as possible to the second Millenium Development Goals, by designing, organising, financing and rolling-out development micro-projects in West Africa, in close collaboration with local authorities and civil society. Génaf projects cycle is two years. Since its foundation in 2003, four projects have been completed successfully, and are still monitored. Projects always embed, in addition to the educational infrastructure and service part, a cultural sharing and exchange program. In 2005, the association built up a surrounded wall for two schools, in Bobo Dioulasso, Burkina Faso. The objective was to separate the schoolyard of the schools from the street, to protect the children from traffic. In 2007, the second project took place in Savalou, Benin. Génaf local partner had expressed the urgent need to extend a primary school, and two new classrooms were built. In 2009, Génaf built up, staffed and launched a three-thousand-books library in Bérégadougou, Burkina Faso, the first of its kind in a rural area of the country. In 2011, two classrooms equipped with numerical kits eructed in N’Gogom, Senegal, under the framework of the international Sankoré program. 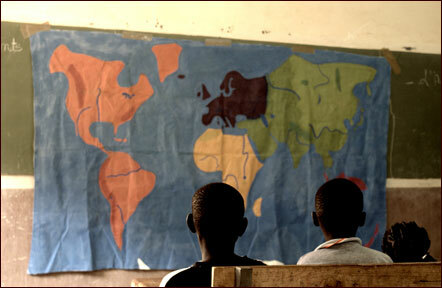 The next project is currently in preparation and will take place in Lioulgou, Burkina Faso, over the 2012-2013 period. This new projects aims at setting up, equip and staff a chemistry classroom in the local high school, and thus create the first technical course of the structure, specialized in agricultural training. All projects are monitored by Génaf in the following years. Génaf insists on building a governance empowering strongly the local actors. This allows the association to follow-up on the impacts, potential issues, needs for project extensions, etc. Every project are elaborated with the beneficiaries, the locals (village youths association, local councilors, teachers, etc.) and aims for the integration to the village life. This appeared to this association as essential to guarantee a genuine cultural exchange.